Who woke up one morning and decided that it was a good idea to refer to minorities and low-income people as “inner-city” and “urban”? I suppose I was in third grade when I learned that the word “inner-city” literally referred to the center of a city, and “urban” as an area within or in close proximity to a city. 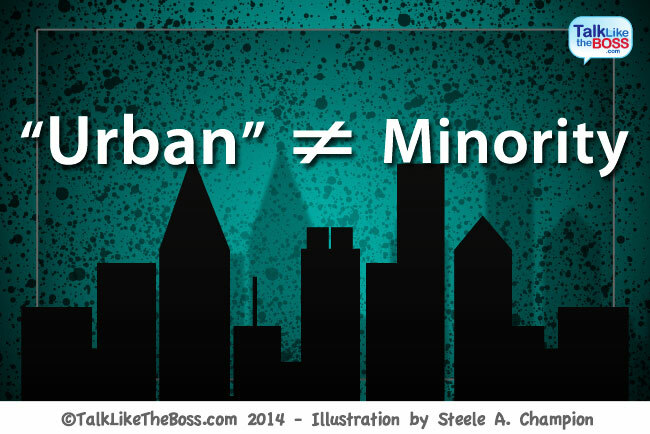 Nowhere in my adolescent education (and the dictionary for that matter) did I observe the terms “urban” and “inner-city” used in a way to refer to African-American, Hispanic and other minority communities as those terms are often used today. Sure I get it, well-intentioned people want to avoid using words that can be perceived as offensive to certain cultural and socioeconomic groups because, as many have witnessed recently in the media, news of people caught saying inappropriate words travels at eye-blink speeds (just ask Paula Deen). Transparency–yet another flavor of the day concept in modern corporate culture that references an inclusive office environment where leaders actively involve their workers in decisions and initiatives that significantly impacts the organization. Almost all of the HR gurus blab on about the importance of transparency and provide a few tactical ideas to help drive openness in a historically extremely departmentalized system–that is, big corporations. And it seems that most of the largest corporations are getting in on the action by crafting language and imagery to reflect that of an office culture that is inherently team oriented and open to the opinions of others. This is the part of the story where I call “BULL” on the bosses for not practicing what they preach. You see, when I interview workers at many of these “transparent” organizations, the feedback I receive is exactly the opposite of a culture that is transparent. Sure, your workers noticed that you paid big bucks to lower the cubicles walls, install LED light fixtures and declutter meeting spaces to make the office look open. But that’s where the notion of transparency stopped–at mere appearances. And there’s much, much, more. So based on countless interviews, surveys and personal observations, it is no stretch for me to say that there is still a very long road to travel in order to get to the place where workers really feel like they are being included in most matters of the business. To that end, REAL transparency doesn’t exist; it is more like “faux-parency” (yes, I made that up). I’d like to introduce a program to any organization that has the guts to make valiant efforts to move their work environment to a place of genuine transparency. But let me warn you – if you aren’t really serious about cultivating a culture of true transparency in your workplace, simply direct your cursor to the small “X” in the corner of this window and click. This idea may be too bold to stomach for many. OK, if you are still with me, good–let me tell you about a policy that you heard here first (I admit, it’s a cheap plug). I simply call it, “The Fly On The Wall Policy,” created with the intent to help remove some of the barriers that keep workers in the dark. Quick Disclaimer–this policy is not a magic bullet that will solve all of the problems associated with the lack of transparency in the office environment…it is just one idea that I believe, if implemented correctly, would show workers that your office is serious about cultivating openness. 1. The What: Workers can politely and quietly invite themselves into any* meeting, in progress or forthcoming, via phone or in-person, to listen, observe and take notes (photography is not permitted, sorry folks). *Alright, so not every meeting can be attended because of course there are a few (and I do mean a few) that involve an individual’s compensation and/or performance. No need to contribute to the current cesspool of office gossip. 2. Claiming “Fly On The Wall” Status: Think of this as a backstage pass where workers will have the opportunity to walk right into the meeting and simply claim the “Fly On The Wall” status which, should not cause any alarm to the original meeting participants. 3. A Few Ground Rules: To keep things civilized, the “Fly On The Wall” worker cannot talk, ask questions, be disruptive, play on their smartphones or do anything an actual fly on a wall could not do (ever seen a fly check email? I didn’t think so). Be a good insect and sit silently. A) The “Fly On The Wall” worker cannot attend a meeting after 15-minutes has transpired (at least be a timely fly). B) The “Fly On The Wall” worker should make a good-faith effort to notify the meeting organizer in advance where possible. However, this should not be a requirement, just a courteous rule of thumb. C) If a meeting is in progress, the “Fly On The Wall” worker should, upon entry, politely show their handy “Fly On The Wall” badge (without saying a word) and sit in the farthest seat away from the meeting participants to avoid being a distraction. Again, I am not foolish enough to think that this will solve all of the problems associated with the lack of transparency in the work environment. However, we believe that our “Fly On The Wall” policy will help open some of the doors that once kept workers ignorant of the critical initiatives, events and projects happening around them every day. The feedback and data suggests that workers desire to be included in significant business matters. And of course, the corporate world will get closer to the precious transparency that they all claim to cherish. And ultimately part ways with this “faux-parency” crap that exists in most office environments. Is there one…just one daring organization out there with the courage to step-up and implement a bold initiative like our “Fly On The Wall” policy? All revolutions began with just one. 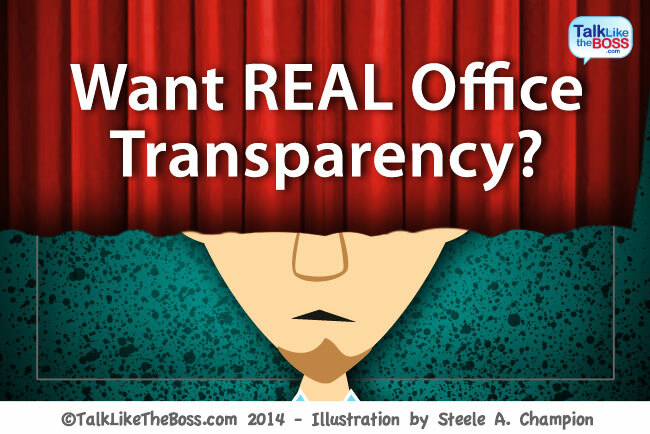 Come on bosses; aim for transparency…REAL transparency. Is Your Company Stealing Your Salary? TalkLikeTheBoss.com Powered by WordPress and theme by	gazpo.com.